Welcome to the Exchange Online section of the Exchange TechNet Wiki, your source for guidelines and information written by the community for the community. Exchange Online is part of Office 365. If you're looking for the official Exchange Online product documentation, please follow this link. The power of Exchange email, calendar, and contacts with built-in functionality to help protect against viruses and spam at no extra cost giving customers anywhere access to mailbox data across PCs, the Web and mobile devices. Large mailboxes: Each user gets 25 GB of mailbox storage standard and the ability to send attachments up to 30 megabytes (MB). Antivirus/anti-spam: Microsoft Forefront Online Protection for Exchange is included, providing multiple filters and virus-scanning engines to help protect your organization from spam, viruses, and phishing scams. The Exchange Online version included with Office 365 is built on the same technology as Exchange Server 2010 SP1. This Exchange Online version provides organizations with the latest capabilities including built-in archiving, optional Conversation View, and Mail Tips, along with powerful web-based tools for managing online deployments. With this Exchange Online version, Microsoft handles the ongoing maintenance, patches, and upgrades of the Exchange infrastructure while providing IT administrators the control and flexibility they require just like they do now with the version included with BPOS. The Exchange Online version included with Office 365 is built on the same technology as Exchange Server 2013. This Exchange Online version comes with EDiscovery, DLP (Data Loss Prevention) & Much more, Some of the great features are listed below. Currently Office365 Offers Small Business Premium, Essential & Enterprise subscriptions. Exchange Online Protection (EOP) is replacing FOPE (Forefront Online Protection for Exchange) from previous version, EOP is more efficient in filtering messages, Especially DKIM is now supported with Exchange Online. 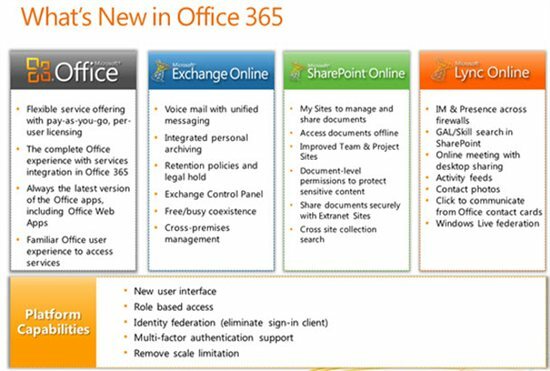 Office 365 - What does it mean for Exchange?